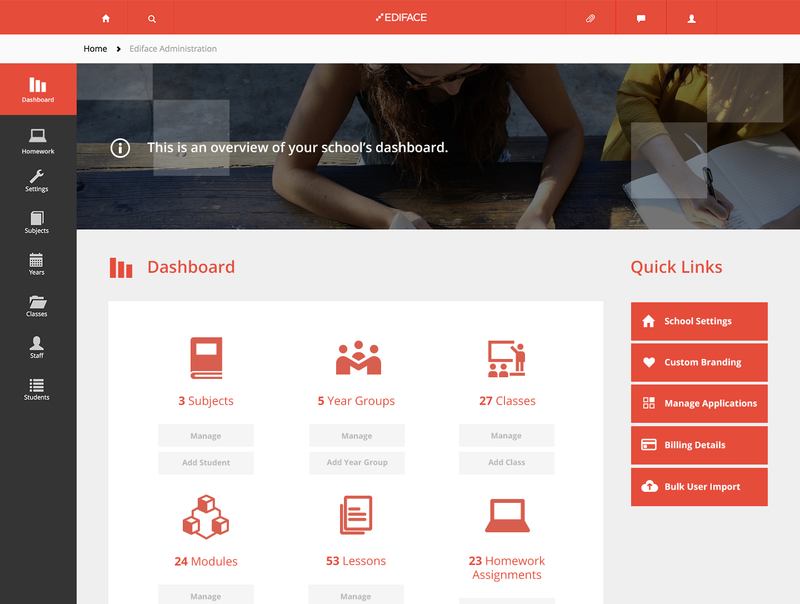 The Ediface Platform is an easy-to-use digital hub for the creation, storage and distribution of lesson plans, homework assignments and learning content. Our mission is to develop a world leading education platform to suit the needs of educators and learners - one that provides powerful educational benefits, but is simple enough to be used by everyone. Teachers are given a central location for curriculum planning where they can deliver interactive lessons and publish selected lesson material to students – excellent for planning lessons, revision material, lesson cover or simply helping students to catch up after absences. 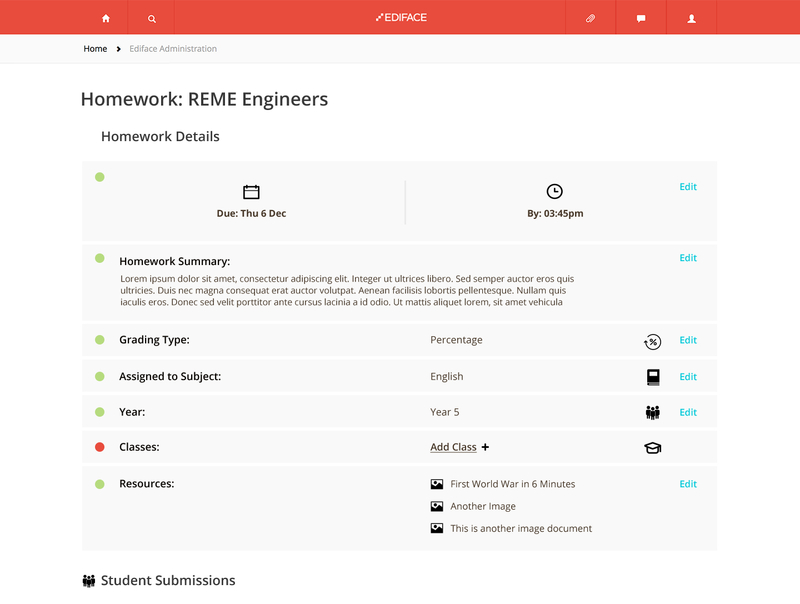 Teachers can set homework online and students can submit their work digitally. Assignments are clearly laid out and easily distributed, ensuring that that the task is clear and that children are always aware of what they have been assigned. Teachers can create and publish assessments that are automatically marked, with results provided in the form of clear, real-time reports. These insights help gauge learning, guide the learner on next steps and track progress effectively over time. Teachers have access to third party resources such as videos, images, and quizzes and can contribute to a school-wide resource library, using our fast and intelligent search facility to compile and share impactful learning material with students. Our simple and intuitive tools make it easy to use digital resources for learning, increasing confidence among students and teachers in their use of ICT. We provide an efficient way for students to submit homework electronically, resulting in reduced paper waste and reduced printing costs. Using Ediface, schools can build their own library, using our intelligent search facility to help staff compile and share impactful learning resources. 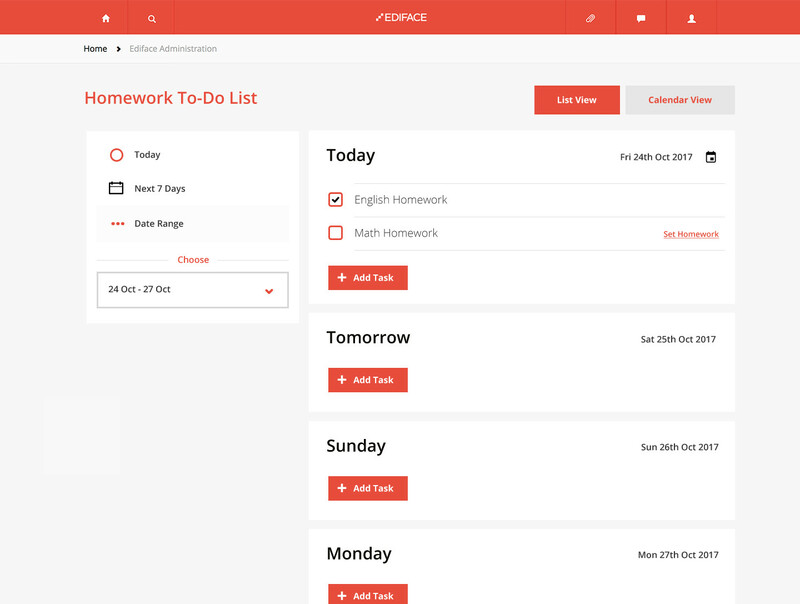 Ediface gives you access to your curriculum from any location at any time - excellent for revision, planning cover and catching up during and after absences. Homework assignments are clearly laid out and easily distributed, ensuring that that the task is clear and that children are always aware of what they have been assigned. We make it easy for teachers to compile, structure and share digital resources to support a variety of learning styles, giving students the ability to learn at their own pace in their own time. Learning materials can be made available to Students before lessons are taught making it easy for teachers to adopt a flipped classroom approach. Today´s students love using technology. This is how they want to learn. Ediface makes it easy for schools and educators to make this possible. If your are interested in using the Ediface Platform on a free trial basis, please contact us and we will arrange this for you. If you would like to use a demo, you can do so by filling out the form below. This will allow you to explore Ediface in your own time to make sure you are happy that this is the product for you. At present, we only offer one pricing plan. This is because we believe in keeping things simple; allowing every customer to use our full suite of services. We accept most credit and debit cards, including Visa, MasterCard and American Express. Once you have provided your authorisation, payments will be made automatically based on the number of students on the system. Yes. We take data protection seriously. There are certain pieces of information that we require in order to provide our services. However, we only use data that is necessary for our system to function and we do everything possible to protect this data. For more details please view our GDPR and Privacy Statements. We have worked hard to try and make the Ediface Platform as intuitive as possible so that there is very little need for training. However, if you feel that training would be useful, please contact us and we can organise something for you. We have also created a helpful series of videos that provide guidance on how to use the Ediface Platform. There is no physical contract for you to sign, but when you sign up as a new customer, you are asked to read and agree to our Terms of Service before completing your registration. If users have any questions, they can either email us directly at at support@ediface.org, or use the communication facility on the Ediface Platform to ask questions and give feedback to the support team, who are usually quick to respond. Complete a simple form to provide us with your contact details and information about your institution. Click here to send us an email and get started. You will be asked for your pament details. No payment will be taken at this point, but we will keep your details securely on file. Once you have registered students on the system a fee will be calculated and your card will be charged on a pro-rated basis for the year ahead. After providing us with your details, you will be sent an email with a link to verify your email address. Clicking on this link will complete the process, taking you to your newly created Ediface site. Please fill out the form below with your details. Once you have submitted your details we will be in touch with instructions to enable you to access the system. You can either be charged annually or montly. The montly rate is $1 per student per month. The annual rate is discounted at $10 per student per year. Please enter your card details below. No payment will be taken at this point, but we will keep your payment details securely on file. Once you have registered students on the system a fee will be calculated and your card will be charged on a pro-rated basis every month. The offer code is either invalid or out of date. Please contact us on sales@ediface.org to see what offers are available to you. Congratulations on signing up to Ediface. You will receive an email in the next few minutes with a link to a new Ediface domain for your institution. Simply click on the link to verify your email. once you click on this link, you will be asked to set yourself a password. Once this is done, you have everything you need to log in and get started! IMPORTANT - By creating an account and by utilising the service provided by Ediface Limited you agree to be bound by these Terms and Conditions. Ediface Ltd ("Ediface") is the producer and owner of the "Ediface Platform" (collectively referred to here as the/our "Platform" or our "Services' The Ediface Platform is a digital hub for the creation, storage and distribution of lesson plans, homework assignment and learning content. The Service may contain information, data, text, photographs, videos, audio clips, written posts and comments, software, scripts, graphics, and interactive features generated, provided, or otherwise made accessible on or through the Service (collectively, “Content”). Subject to these Terms of Service, Ediface grants to You and each user of the Service a worldwide, non-exclusive and non-transferable license to use Content solely for purposes of using the Service. Use, reproduction, modification, distribution or storage of any Content for other than purposes of using the Service is expressly prohibited without prior written permission from us. You shall not sell, license, rent, or otherwise use or exploit any Content for commercial use or in any way that violates any third party right. For the purposes of these Terms of Service, “Content” also includes all User Content (as defined below). An "Account" referred to herein means a service, provided by Ediface, where You may use Ediface to create, update, share, and publish information, data, text, videos, images or other materials ("User Content"). Unless explicitly stated otherwise, any new features that augment or enhance the current Service, including the release of new tools and capabilities, shall be subject to the Agreement. Ediface will provide the Service in accordance with this Agreement. Ediface may at its sole discretion modify the features of the Service from time to time without prior notice. In order to use the Service, You must have a valid Account. To acquire an Account for the Service, You must provide Ediface with an email address and other information ("Registration Data"). You are responsible for maintaining the confidentiality of the access data for Your Account, and are fully responsible for all activities that occur under Your Account. You agree to (a) immediately notify Ediface of any unauthorized use of Your Account or any other breach of security, and (b) ensure that You exit from Your Account at the end of each session. Ediface cannot and will not be liable for any loss or damage arising from Your failure to comply with this section. In consideration of use of the Service, You agree to: (a) provide true, accurate, current and complete information about Yourself as prompted by the Service's registration form, and (b) maintain and promptly update the Registration Data to keep it true, accurate, current and complete. Ediface assumes no duty to verify such information as further detailed in the CONTENT OF THE SERVICE section of these Terms of Service. If You provide any information that is untrue, inaccurate, not current or incomplete, or Ediface has reasonable grounds to suspect that such information is untrue, inaccurate, not current or incomplete, Ediface has the right to suspend or terminate Your Account and refuse any and all current or future use of the Service (or any portion thereof). By using the Service (and registering an Account on the Service), You represent and warrant that solely responsible for ensuring that these Terms of Service are in compliance with all laws, rules and regulations applicable to you and the right to access the Service is revoked where these Terms of Service or use of the Service is prohibited or to the extent offering, sale or provision of the Service conflicts with any applicable law, rule or regulation. Access to the Ediface Platform is a paid service where you shall pay fees (described below) to Ediface. Credit cards are the only payment mechanism Ediface will accept for payment ("Subscription Fee") and all currency references are in GBP. Ediface uses a third party payment provider called Stripe who manages all payments to Ediface. Details of the Terms of Service for Stripe can be found through -https://stripe.com/gb/connect-account/legal. When creating an account You will provide Ediface with the necessary billing information ("Billing Data"). You must provide current, complete and accurate Billing Data and the credit card that You provide as part of the Billing Data will be automatically and immediately billed on the day You sign up. You agree that Ediface (through Stripe) may charge to Your credit card all amounts due and owing for Your Account on that yearly basis unless you cancel the account (see the "Termination, Breach, Suspension and Cancellation" and "Refund" sections of these Terms of Service). Ediface will contact You via electronic mail to alert You upon each charge. Ediface may change prices at any time without prior notice, but will endeavor to provide reasonable advance notice via the Ediface website and/or electronic mail. You agree that in the event Ediface (through Stripe) is unable to collect the fees owed to Ediface for Your Account through Your Subscription Fee, Ediface has the right to suspend or terminate Your Account and refuse any and all current or future use of the Service (or any portion thereof). You must promptly notify Ediface if Your Payment Method is changed (for example, for loss or theft) or if You become aware of a potential breach of security, such as the unauthorized disclosure or use of Your name or password. If You fail to provide any of the foregoing information, You agree that Ediface may continue charging You for any use of the Paid Plan under your Billing Data unless You have terminated Your Paid Plan as set forth herein. As long as Your Account remains active and in good standing, You will be charged the Subscription Fee even if You never use the service. You may, however, cancel Your Subscription at any time. If Your Subscription Fee payment is overdue, Ediface will disable Your access to Your Ediface account after 14 days. Ediface may, at its sole discretion, at any time and for any reason, terminate the Service, terminate this Agreement, or suspend or terminate Your Account. In the event of suspension or termination, Your account will be disabled and You may not be granted access to Your Account or any files or other Content (including Your User Content) contained in Your Account, and Ediface may delete Your User Content, although residual copies of information may remain in our system for some time for back-up purposes. In the event of termination, Ediface may also withdraw and at its discretion reallocate the public web address of Your Account. If You terminate Your Account, via an email or mail to Ediface, and You request that Ediface delete Your User Content and files contained in Your Account, Ediface will make all reasonable efforts to do so. Ediface provides means for Account cancellation through the Ediface Platform and via an email to support@ediface.org. If You cancel Your Account within 20 calendar days of the date of sign up, and You request a refund, Ediface will refund all payments You have made to Ediface within the 20 calendar days prior to the cancellation and refund request. Ediface and/or its suppliers, as applicable, retain ownership of all proprietary rights in the Service and in all trade names, trademarks and service marks associated or displayed with the Service. You will not remove, deface or obscure any of Ediface's or its suppliers' copyright or trademark notices and/or legends or other proprietary notices on, incorporated therein, or associated with the Service. You may not reverse engineer, reverse compile or otherwise reduce to human readable form any software associated with the Service. You acknowledge that any use of the Service contrary to this Agreement, or any transfer, sublicensing, copying or disclosure of technical information or materials related to the Service, may cause irreparable injury to Ediface, its affiliates, suppliers and any other party authorized by Ediface to resell, distribute, or promote the Service ("Resellers"), and under such circumstances Ediface, its affiliates, suppliers and Resellers will be entitled to equitable relief, without posting bond or other security, including, but not limited to, preliminary and permanent injunctive relief. Ediface does not claim ownership over any User Content submitted on or through the Service unless this content has been explicitly created for Ediface by an affiliates, supplier or other party authorized by Ediface. Your User Content belongs to You. 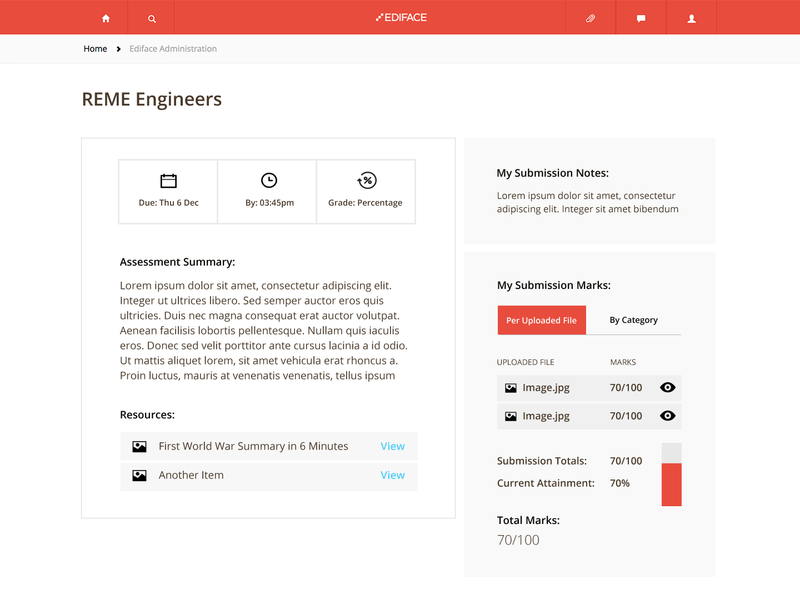 However, by uploading any User Content to the Service, You agree that Ediface may store and display (only to You, your School teacher, students and parents if you choose to publish the content) Your User Content solely as necessary in connection with the Service. To the extent You choose to share any of Your User Content with other users of the Service, You agree to allow these users (i.e., only the users you specify) to view Your User Content and, to the extent applicable, collaborate with You and Your User Content. You understand that all User Content is the sole responsibility of the person from which such User Content originated. This means that You, and not Ediface, are entirely responsible for all User Content that You upload, publish or otherwise make available via Your Account. Ediface does not control the User Content posted via the Service and, as such, does not guarantee the accuracy, integrity or quality of such User Content. (d) protect the rights, property, or personal safety of Ediface, its users and the public. If Ediface discloses User Content to comply with legal process or respond to claims that any User Content violates the rights of third-parties, to the extent permitted by law, regulation or legal process, Ediface agrees to provide You with prompt notice of any such legal or governmental demand and reasonably cooperate with You in any effort to seek a protective order or otherwise to contest such required disclosure. (i) promote or provide instructional information about illegal activities, promote physical harm or injury against any group or individual, or promote any act of cruelty to animals. (k) exceed the scope of the Service that You have signed up for; for example, accessing and using the tools that You do not have a right to use, or having humans share User logins, or deleting, adding to, or otherwise changing other people's comments or User Content as an Account holder. If any user is reported to be in violation with the letter or spirit of these terms, Ediface retains the right to terminate such account at any time without further warning. You agree that Ediface has no responsibility or liability for the deletion of, or the failure to store or to transmit, any User Content and other communications maintained by the Service. You acknowledge that Ediface may establish general practices and limits concerning use of the Service and may modify such practices and limits from time to time. Ediface retains the right to create limits on use and storage at our sole discretion at any time with or without notice. You acknowledge that we reserve the right to log off users who are inactive for an extended period of time. (d) copy, reproduce, alter, modify, or publicly display any information displayed on the Service (except for Your User Content), or create derivative works from our website (other than from Your User Content), to the extent that such action(s) would constitute copyright infringement or otherwise violate the intellectual property rights of Ediface or any other third party, except with the prior written consent of Ediface or the appropriate third party. (e) protect the rights, property or safety of Ediface, its users and the public. Ediface will not be responsible or liable for the exercise or non-exercise of its rights under this Agreement. If Ediface discloses such information to satisfy any applicable law, regulation, legal process or governmental request or to respond to user support requests, to the extent permitted by law, regulation or legal process, Ediface agrees to provide You with prompt notice of any such demand and reasonably cooperate with You in any effort to seek a protective order or otherwise to contest such required disclosure. You agree not to reproduce, duplicate, copy, sell, resell or exploit any portion of the Service, use of the Service, or access to the Service without the express permission by Ediface. You represent and warrant that (a) all of the information provided by You to Ediface to participate in the Service is correct and current; and (b) You have all necessary right, power and authority to enter into these Terms of Service and to perform the acts required of You hereunder. You understand and agree that the Service is provided "as is" and Ediface, its affiliates, suppliers and Resellers expressly disclaim all warranties of any kind, express or implied, including without limitation any warranty of merchantability, fitness for a particular purpose, non-infringement or bailment of your data on Ediface's servers. Ediface, its affiliates, suppliers and Resellers make no warranty or representation regarding the results that may be obtained from the use of the Service, the security of the Service, or that the Service will meet any user's requirements. Use of the Service is at Your sole risk. You will be solely responsible for any damage to You resulting from the use of the Service. The entire risk arising out of use, security or performance of the Service remains with You. No oral or written information or advice given by Ediface or its authorized representatives shall create a warranty or in any way increase the scope of Ediface's obligations. You agree to indemnify, defend and hold harmless Ediface, its affiliates, officers, directors, employees, consultants, agents, suppliers and Resellers from any and all third party claims, liability, damages and/or costs (including, but not limited to, solicitors fees as and when incurred) arising from Your use of the Service, Your use of Your Account, Your violation of these Terms of Service or the infringement or violation by You or any other User of Your Account, of any intellectual property relating to the Service (including without limitation Your User Content) or other right of any person or entity. Ediface reserves the right at any time and from time to time to modify or discontinue, temporarily or permanently, the Service (or any part thereof) with or without notice at any time. You agree that Ediface shall not be liable to You or to any third party for any modification, suspension, termination or discontinuance of the Service. No agency, partnership, joint venture, employee-employer or franchiser-franchisee relationship between You and Ediface Software is intended or created by these Terms of Service. In no event will Ediface or its affiliates, suppliers or Resellers be liable for any special, incidental, indirect, exemplary or consequential damages whatsoever (including, without limitation, damages for loss of business profits, business interruption, loss of business information, or any other pecuniary loss or damage) arising out of the use of or inability to use the Service, or the provision of or failure to provide technical or other support service, whether arising in tort (including negligence) contract or any other legal theory, even if Ediface, its affiliates, suppliers or Resellers have been advised of the possibility of such damages. In any case, Ediface, its affiliates', suppliers' and Resellers' maximum cumulative liability and Your exclusive remedy for any claims arising out of or related to this Agreement will be limited to the amount actually paid by You for the Service (if any) in the previous twelve (12) months. This Agreement shall be governed by and construed under UK law. Ediface Ltd ("Ediface") is the producer and owner of "The Ediface Platform" (collectively referred to here as the/our "Platform" or our "Services'. The Ediface Platform is a digital hub for the creation, storage and distribution of lesson plans, homework assignment and learning content. We understand that your data is of prime importance. We take the protection, security and confidentiality of your data seriously and are committed to ensuring that every precaution is taken to protect it. Information you provide to us directly (personal information). Device information - we collect information about the device you are accessing our services from. This includes the type of device and the version of the operating system you are using. Information collected from your use of our services is non-personally-identifying information of the sort that web browsers, servers, and analytics services typically make available. We collect this non-personally-identifying information in order to better understand how visitors use our services and, where possible, to improve their experience. In some cases, we may publicly display information that is not personally identifying as an aggregate, (e.g., by publishing a report on trends in the usage of our services) or may provide the aggregate data to third parties. School Information - When you register to use our services, we will create a domain for you and your organisation. Your information will only be available within this domain. In the process of creating this domain we will collect your domain name (e.g. yourschool.ediface.org), your email address (as Admin owner), your first and last name and your password. We do not store any credit or payment card information. This is collected and stored by our third party payment provider. School Data - This includes teacher information (first name, last name and email address), student information (first name, last name and email address), class and subject names. Learning Materials (Teacher created) - This includes curriculum detail added by the school, module and lesson information, lesson plans, lesson slides, resource created and added by the school, homework items and student progress data such as marks and grades. Learning Materials (Student created) - This includes submitted homework items and any resources added by any student. We only collect as much information as is necessary or appropriate given the type of interaction. We do not disclose personally identifying information and you can always refuse to supply personally identifying information, with the caveat that it may prevent you from engaging in certain activities. If you are outside of the European Union, you should know that any personally identifiable information you provide will be transferred into the European Union. By using our services, you consent to such transfer and are representing that you have the right to transfer such information outside your country. When using Ediface you may choose to add and display information for the purposes of learning and to support the education process. This information is voluntarily added and remains the intellectual property of the school (if added by the school) and the teacher (if the teacher is not under content licence obligation). As such, it is not subject to the protocols listed below. This is because you maintain control of the content you create when using our services. Whilst content created or purchased within a school domain is only visible within the school domain, please remember that if you choose to provide personally identifiable or confidential information, individuals within a school domain reading such information may use or disclose it to other individuals or entities without our control and without your knowledge. We therefore urge you to think carefully about what information is entered on to your school domain. We will not share content between schools unless specific permission or a specific request has been granted by the content owner to support@ediface.org. We always want to give you notice on the personal information we take and how we use it, including any types of third parties to which we might disclose it to and the choices we offer you to limit the use of your information. This excludes "agents," such as vendors or contractors, who are only processing such information for us on our behalf or at our direction. We will notify you before we use any information for something other than the purpose for which it was originally collected. We always want to make sure you have control in how we share your personal information with others. We will never share any of your personal information with non-agent third parties unless we are required to do so by law, or if we believe in good faith that disclosure is reasonably necessary to protect our property, rights or those of third parties or the public at large. It is possible that we may, on occasion, buy or sell assets from or to other companies. If that should occur, user information is typically one of the assets that get transferred. Similarly, if Ediface was acquired, or in the unlikely event that we go out of business or enter bankruptcy, user information could be transferred or acquired. You should be aware that such events can occur, and that if it does, the buyer may continue to use your personal and non-personal information, but only as set forth in this policy. We may from time to time request some of your financial information for the purposes of completing transactions you have initiated through the Services. This is to protect against or identify possible fraudulent transactions, and otherwise as needed to manage our business. Prior to providing agents with any personal information, we will obtain assurances that they will safeguard it in accordance with this policy. Although most changes are likely to be minor, we may occasionally need to change this policy. If we do update it, we'll notify you either by email or we will post the new policy on our services. If you have any concerns or complaints about how you think we've handled your personal information, please contact us at privacy@ediface.org. GDPR came into effect from 25th May 2018 and we understand the importance of these regulations and their importance to our customers. Whilst we require certain data to provide our service, we always make sure we only take what data we need and that we always act responsibly with this data. We use 3rd party service providers where there is a fundamental need for their integration in providing our service or if they provide us with a unique opportunity to increase the performance of the platform. We only select 3rd party service providers that provide industry leading solutions and maintain the highest security standards. Used for sending anonymous usage of the platform so we can see what pages are visited and the frequency they are visited. Used for indexing and searching resources (files such as PDF, JPG, PNG, Office files). Anonymised (numeric ID) is sent to identify the author of the resource. Provides users with DropBox and BOX interaction from a single interface. Used when signing up and modifying subscription terms. We do not store any of the payment data ourselves and only the account holder and his payment details are held in Stripe. Stripe (https://stripe.com) is an internationally used and trusted payment processor. Main hosting of database and all customer data. We will keep working with these service providers to make sure that together we continue to deliver high standards of security and data protection. We have put internal processes in place to prohibit unauthorised access to any of the personal data held in our databases without the explicit permission of our Privacy Officer. All database access is audited and access can only be given through approved Ediface resources. If requested by an inpidual, we can provide a view (in a digital readable format) of any personal data that we hold for that inpidual. If requested by Teach it Right we can permanently delete any student or teacher profiles and associated personal data. This data is only used for the sole purpose of updating school information on the Ediface Platform. This data will only be shared with Ediface employees and will never be shared with any 3rd party. This data will be deleted from local storage within 72 hours of a successful upload - we will never hold school data in local files or folders on any computer. We hold your personal data for as long as it is required to allow you to make use of our services. If a teacher or student is deleted from the system by a member of staff with administrator permissions on the Ediface settings page, then their account will be archived – they will no longer appear on the system, but previous records are maintained in case the administrator wishes to restore their account in the future. In the event of a data breach we will make you aware of the incident and the actions we will be taking towards resolution within 2 hours of our first knowledge of the breach. We will also make our local Data Protection Authority aware in accordance with GDPR.